Spy pens can be pretty neat. It’s like having something out of a James Bond movie. Except with the advance of modern technology, real spy pens are often better than what you’ll see in old movies. For picking nearly any piece of technology, it’s important to take a close look at the details. But details are even more valuable when looking at a spy pen. Especially if you expect the pen to perform equally well as a pen and a camera. 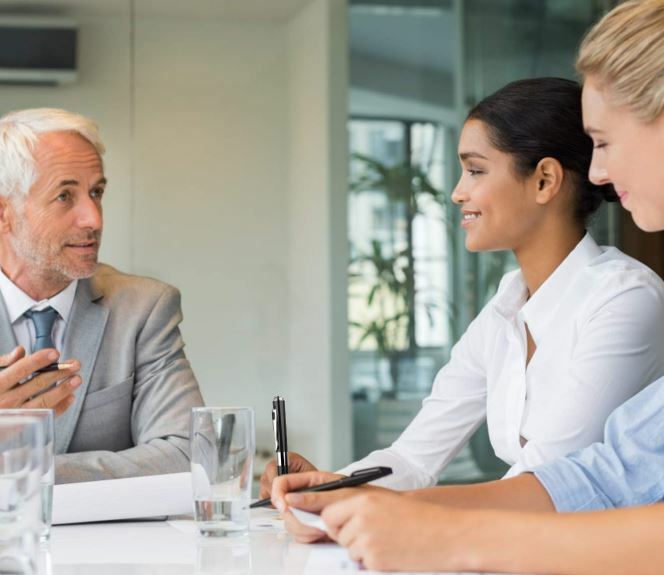 Getting the right spy pen almost entirely depends on your ability to predict how you plan to use the pen. Or more specifically, what you hope to capture, and how often you plan on using the device. 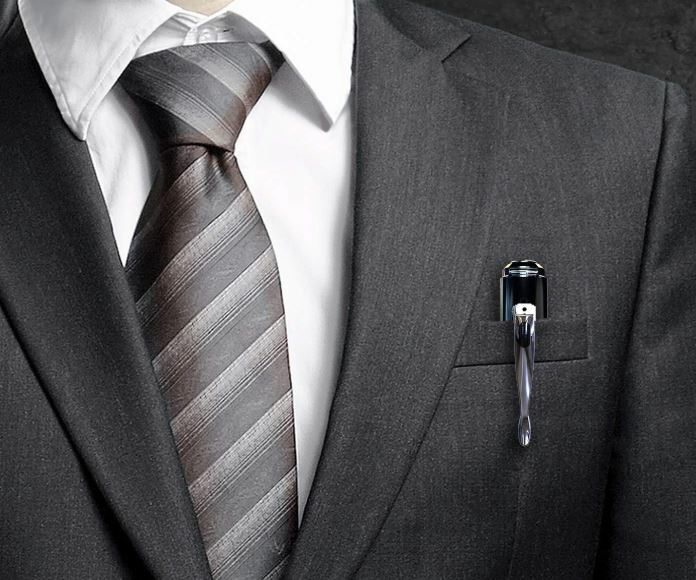 If you’re going to carry around a pen, spy pen or not, it ought to look nice. In terms of subtly, it shouldn’t be obvious the pen is actually capable of recording. Some spy pens are built a little subtler than others. Being subtle is mostly about disguising the fact there’s a lens on the pen. Making the lens very small, and blending in with the color of the pen can help this along. Which is why virtually all spy pens are constructed with a black chassis. But some designs are subtler than others. Is the pen any good? More often than not, spy pens are pretty unimpressive ballpoint pens. Occasionally it’s possible to remove the ink cartridge and replace it with the guts of a nicer pen. Occasionally, you can only use proprietary ink refills. But the bare minimum you should expect is that the pen can have its ink revitalized at some point in time. Spy pens tend to be bulkier, for reasons which should mostly be self-explanatory. But some pens are bulkier than others, and sometimes that can get in the way of ergonomics. Considering the grip and feel of the pen can matter a great deal if you end up writing with it. How do you charge the pen? Having to install a battery isn’t a grave inconvenience, but it’s typically better to be able to charge the camera through USB. Because the relatively small batteries inside of these devices, you can typically expect between 30 minutes and 90 minutes of recording time. But some pens are capable of providing more, and some less. With respect to visual quality, you’ll find that the best spy pens will hover around 1080p. Because you don’t need more than 1080p content to really see what’s going on. Though some spy pens go to slightly greater resolutions, which can be useful for people who are interested in some type artistic endeavors. The same is true for frame rates. Being able to capture in 30fps is everything that most people will need, but there are some niche circumstances where being able to capture in higher frame rates can be useful. Okay, you’ve captured some video. Now how to do get the data off the pen? 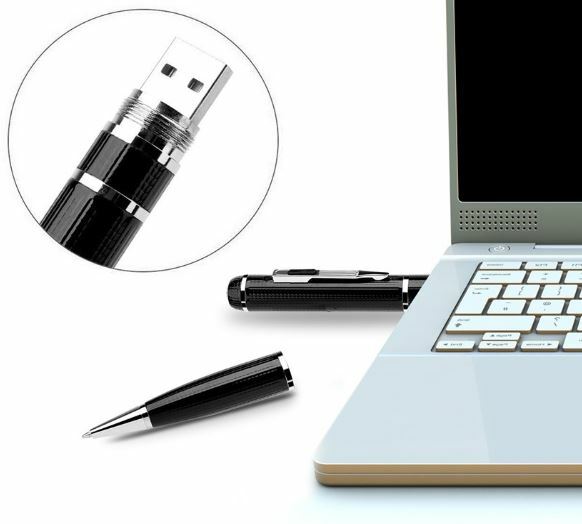 In some cases, pens are built with micro USB cards, which are often not included with the spy pen itself. Other pens use internal storage, and then allow you to export the data across a wired interface like USB. 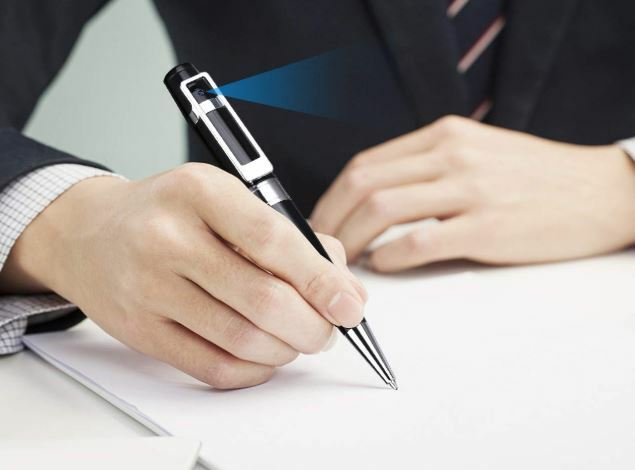 The Goospy Spy Camera Pen isn’t going to blow you away. But there’s much to appreciate about simplicity. Like you’d expect, this is basically a pen with a camera hidden inside. But Goospy really succeeds when it comes to small details. For instance, you can use this as a pen for normal writing while also recording video. You can swap the ink, and the pen actually feels pretty comfortable in spite of its slightly bulky size. It does have limitations, like the camera’s lack of infrared vision. Is that a deal breaker? It really depends on whether or not you need to record in the dark. This pen has a total length of about six inches, and a diameter that nearly approaches one full inch. That makes this a slightly bulky pen, but not so much that a person with small hands would have trouble using it, nor so much that it become suspicious. The camera sits atop the pen, with the lens discreetly placed inside of a decorative design, rendering it effectively invisible. It records in full 1080p HD. Though it doesn’t offer special color depth options to speak of, it does provide full clarity, similar to recording with a smartphone. Content is captured at 30FPS, which is slightly better than the smoothness of broadcast television. Recordings are saved in AVI format, which is pretty close to universally compatible with any platform or device you might want to play video on. And your data is recorded to a built-in 16GB Micro SD card. In order to retrieve that information, you’ll need to pull from the onboard USB 2.0 port. Any platform supporting USB 2.0 will get the job done, including both Windows and Mac OS X. 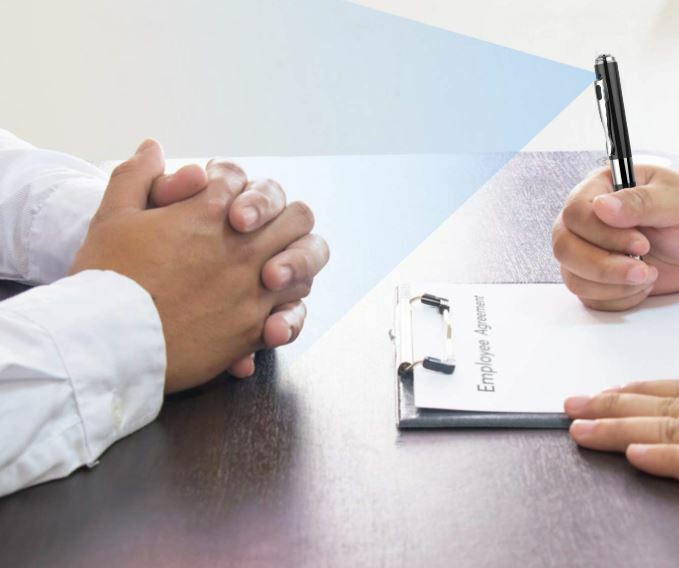 For people who were intentionally looking for a lens on your pen, and they were to closely investigate the pen in their hands, they would be able to spot the lens. That’s really the only limitation to remain aware of as you think about being subtle. This kit includes a pair of ink refills, a short user manual, and the spy camera pen itself. The user manual mostly instructs you on how to get the most out of your ink refills, and how you can interact with the Micro SD interface. It also includes a 12-month warranty and lifetime support. The Portocam POT21 doesn’t get nearly as much credit as it deserves. 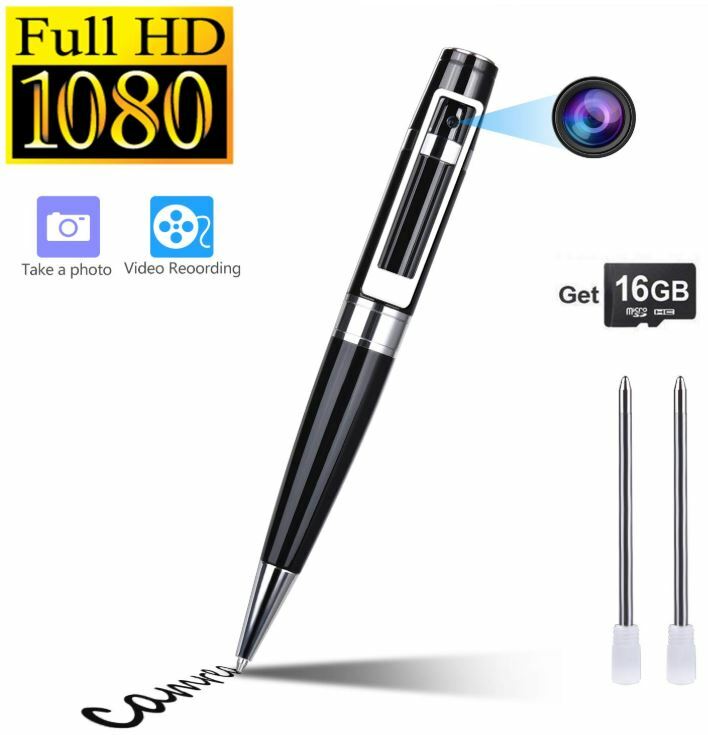 This pen hits all of the basics, like 1080p recording, so you’re able to record clear videos for conferences, lectures, and so on. But it also provides formidable support when it comes to night vision recording and an expandable memory capacity. Part of the reason it doesn’t get enough credit is because this camera doesn’t give you everything you need to get started. But that’s really just another way of slashing a few bucks off the price for people who don’t need a bunch of extras, right? The POT21’s camera lens sits atop the base of the pen. From inside a short pocket, the lens is perfectly positioned for a great view. That camera is powered with the help of a built-in lithium ion battery. It’s a 400mAh cell, which is actually about one third as powerful as the battery used inside some smartphones. It’s pretty powerful, for a pen. From a full charge, that battery can provide you with about three hours of consecutive recording, or 90 minutes of night recording. The night recording takes considerably more power to operate, but you’re able to set the recording to trigger based on motion, which can help make things a bit more practical. As mentioned previously, this pen is capable of delivering full 1080p. Unfortunately, you can’t decrease that to lower resolutions, or make any create changes to framerate. Your saved video content is recorded into various folders to make the filing process easier. When you’re getting night footage, everything comes through in black and white. The lack of color can make certain contrasts difficult to make out, but it’s actually pretty impressive for such a small pen to provide night vision in the first place. The lens is tremendously well disguised. The only person who would be able to identify this as a camera pen would be a person who knew precisely what a camera pen looked like, and knew to search for the lens. Unfortunately, the POT21 does not record audio, and it cannot be used to take pictures. While this pen saves content to an SD drive, an SD card is not included. Video clips reach a maximum of two minutes per file. Additionally, the POT21 doesn’t include any refill ink. 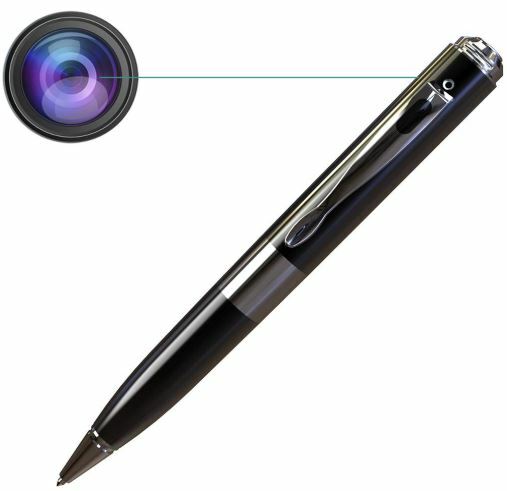 Unusually, the Letown 1296P Spy Camera Pen provides shooting power which slightly exceeds 1080p. That’s possible with the help of an incredible 20-megapixel sensor. If you leapt back to 2008, you’d find compact camera in this price range would provide maybe 8 megapixels. The 1296P manages to stuff double the power of a pretty decent compact camera into something as small as a pen. And then it starts layering on extra features. Not everyone needs something with this many extra abilities, but for people who use their spy pen more than occasionally, the 1296P is worth a close look. Smart looking pens tend to draw attention. This pen looks pretty sharp, so it’s certain to capture the glances of a few admirers. Because of that, being able to hide the lens is essential. Which is why this design lets you to do precisely that — if you don’t need to use the camera you can flip the lens to cover it. And of course it can be used as a fully functional ball point pen. Except when you remove the end of the pen, a USB port awaits you. The bottom end of the pen features an analogue operation button, which can be tapped to take photos or initiate recordings. And there’s a small blue LED button which can be used to indicate the status of the pen or reset the device. The built-in memory capacity is 32GB, and that’s accompanied by a battery capacity ready for a single hour of continuous recording. One room for complaint is the USB 2.0 interface. It can take a moment to transfer 32GB of data across a USB 2.0 connection. But that huge quantity of data transfer shouldn’t occur on a regular basis, so this isn’t a big issue. 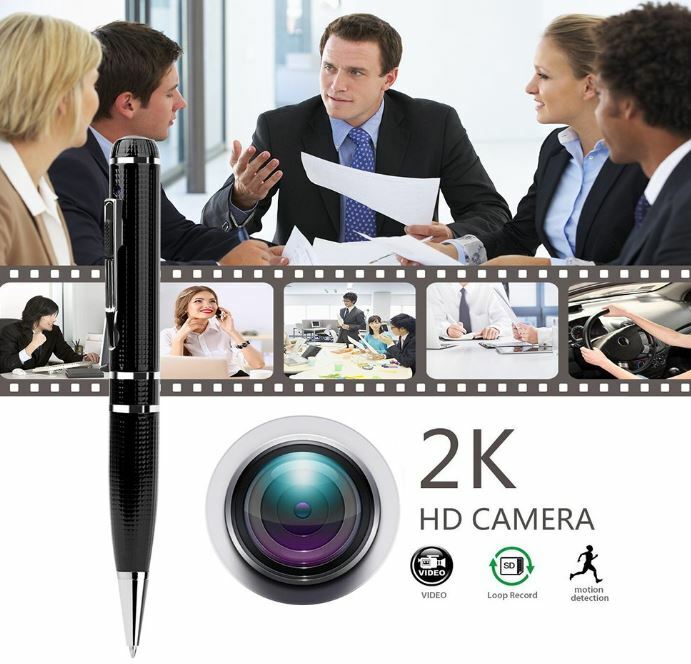 Though some of their advertising lists this as a 2K pen, the pen actually captures 1269p or 1080p footage at 30fps. Unlike many other spy pens, this one allows you to take photos. They’re captured in an enormous 4352×3264 resolution, a testament to the power of the CMOS sensor. Videos are captured in H264 MOV format, along with audio in PCM format. If you need more than 30fps, you’re able to lower the resolution to 720p resolution and capture at 60fps. Depending on what you need, that can provide you with higher framerate footage or footage that’s better at saving storage space. Finally, there’s also a motion detector function. 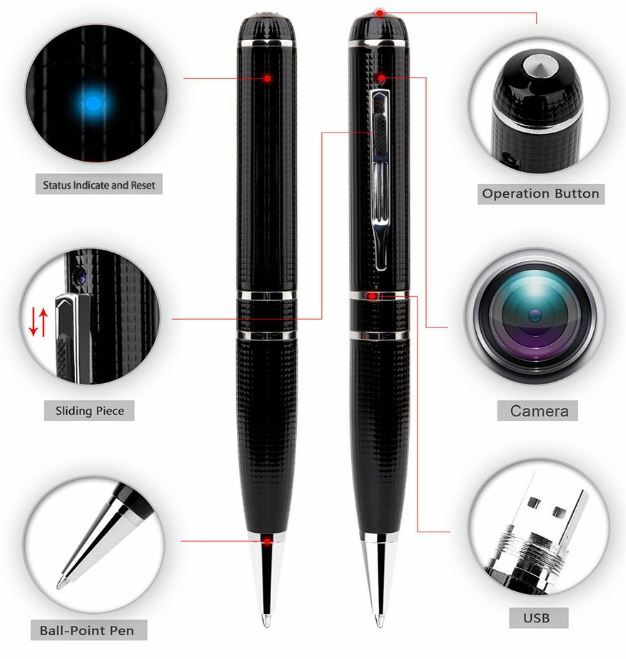 The motion detection function requires you to tap the pens function button four times in a row. 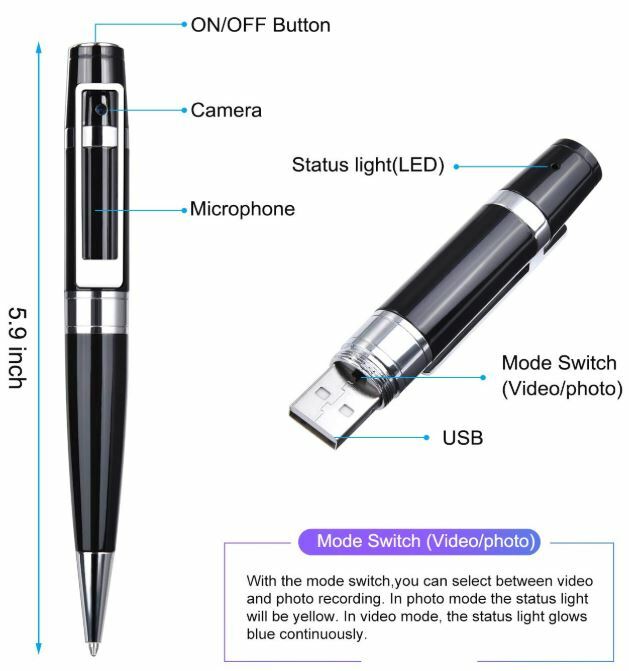 After that, the pen will enter motion detection mode, and can be placed in a stationary position for recording. It takes about 3.5 hours to charge the pen. The viewing angle of the pen’s lens is 65°, which means it’s focused on a particular point of view, making it great for capturing conversations. The USB interface operates smoothly with both Windows and Mac systems, even older systems like Windows XP. In addition to the spy pen, this kit includes a couple pen refills, a USB cable, an AC adapter, and a small pin which can be used to reset the pen. It includes a user manual, though the pen is intuitive enough to start using from the moment you’ve taken it out of the box. It also includes a one-year warranty. If you’re looking for something cheap and simple, the Goospy Hidden Camera Spy Camera Pen is probably your best choice. 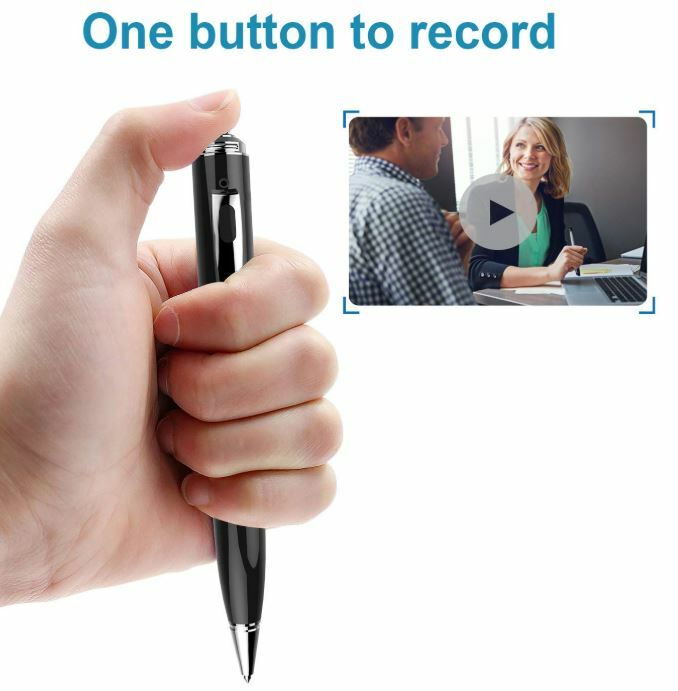 You don’t get audio, you don’t get cool added features like motion detection, but you do get a pen that can record footage in full HD. The pen is bland enough to avoid detection, and it includes enough refills to keep it working as an ordinary pen for some time. The Portocam POT21 Spy Pen Camera Recorder provides something the Goospy pen does not, and that’s night vision. Entering the night vision mode will tear through the internal battery. But for someone who finds that feature essential, the POT21 is the best way to get your hands on night vision at this price point. Though unfortunately, no refill ink is included. 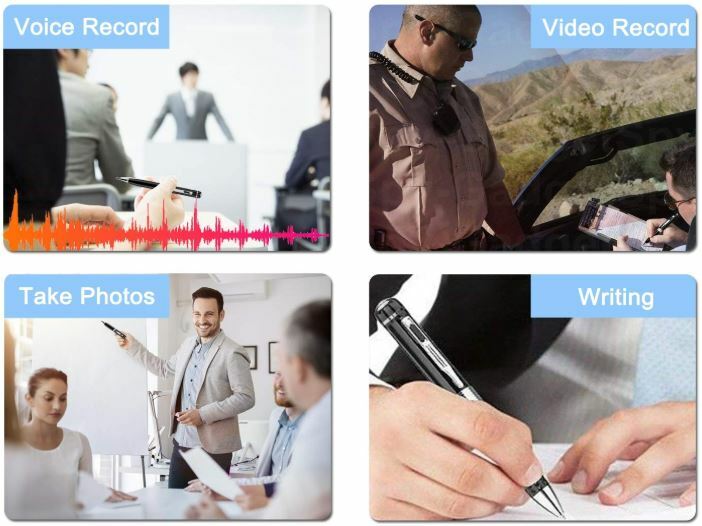 The Letown 1296P Spy Camera Pen is special because it provides what few other pen cameras dare tries – audio recording. In terms of its function a regular pen, it looks stylish and it’s capable of writing smoothly. In terms of being discreet, it’s easily the best spy pen on this list. 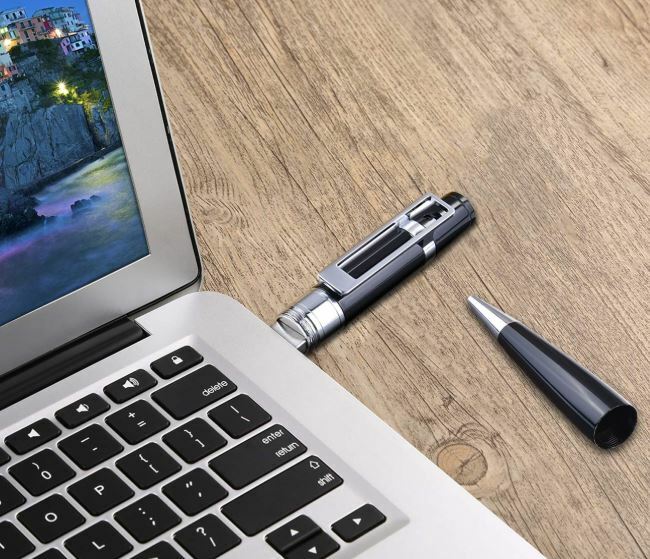 Because you’re able to hide away the lens when you don’t need it for recording, this pen can fool even someone who’s on the lookout for recording devices. We have someone at work stealing petty cash and cigarettes off us. Worst part is he tries to insult our intelligence by saying its our own negligence on other factors. We just can’t prove its him. I hope this can turn the tides. Hate working with a thief. I need a pen to put in my husbands car. I don’t need any visual, I believe that audio would be enough to find out what I need to know. I need to get rid of this awful gut feeling I have had for awhile. Can you suggest a pen for me? Can u transfer files from the pen to ur phone or does it have to be plugged into a computer? Seeking a pen which will discreetly record two “ethically challenged” local police Officers when they falsely arrest someone in our rural area. One may have planted some “illegal child pictures” on his arrestee, recently. Pen needs to look inconspicuously like other pens and needs to continue recording for an extended period of time, even if the falsely arrested owner has his/her hands cuffed.